Republican presidential nominee John McCain leads Democratic rival Barack Obama 46 percent to 44 percent in the latest CBS News poll, which was taken in the three days following the completion of the parties' nominating conventions. The poll marks the first time that McCain, whose two-point lead is within the poll's margin of error, has led Obama in CBS News general election polling. Obama led McCain by three points in a CBS News/New York Times survey released on August 20th, just before the political conventions, and led by 8 points in CBS News polling just after the Democratic National Convention. A CBS News survey conducted last week found the two candidates tied. Though Obama supporters had been much more enthusiastic about their candidate than McCain supporters prior to the conventions, the enthusiasm gap has narrowed considerably. Forty-two percent of McCain's backers now say they are enthusiastic about their candidate, up from 24 percent before the conventions. Fifty-three percent of Obama supporters say the same of their candidate, up slightly from the pre-convention survey. Roughly 80 percent of both candidates' backers say their minds are made up. Registered voters have responded positively to the convention address given by McCain running mate Sarah Palin, who was added to the Republican ticket just more than a week ago. Nearly half say the have a better opinion of the Alaska governor as a result of the speech; just 16 percent say the speech gave them a worse impression of her. Fifty-three percent of registered voters - including 85 percent of McCain supporters - are glad Palin was selected as McCain's running mate. Obama supporters are less enthusiastic about Democratic vice presidential nominee Joe Biden: Just 65 percent of Obama backers are glad the Delaware senator was selected as Obama's running mate. Forty-eight percent of registered voters overall are glad Biden was selected. A third of voters say the vice presidential choices will have a great deal of influence on their vote, with those backing the Republican presidential ticket more likely to say running mates will influence their decision. More voters see Biden, who is a six-term U.S. senator, as prepared to be vice president. Biden is described as prepared for the job by 70 percent of respondents; less than half say the same of Palin. The Alaska governor is seen as more relatable than her Democratic rival, however. Sixty percent of registered voters, including 64 percent of women, describe Palin as someone they can relate to. That's twenty percentage points higher than the forty percent of registered voters who say they relate to Biden. Palin's favorable rating now stands at 44 percent, twice what it was immediately after her selection as McCain's nominee. Biden's favorable rating stands at 37 percent, identical to his pre-convention rating. Independents are more likely to have a favorable opinion of Palin (46 percent) than they are of Biden (31 percent). 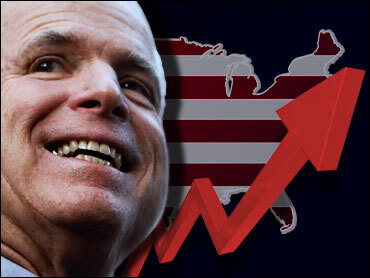 McCain's move ahead of Obama can be traced in part to movement among previously undecided voters. In this survey, CBS News re-interviewed respondents to a CBS News/New York Times poll taken in mid-August. While many previously undecided voters remain undecided, more of those re-interviewed have moved towards McCain than Obama. Thanks in large part to the Palin selection, McCain has rallied his white evangelical supporters. The percentage of white evangelical McCain supporters re-interviewed for this survey who are enthusiastic about McCain has doubled to 48 percent from before the convention. Nearly three in four former supporters of Hillary Clinton, meanwhile, now back Obama over McCain. In the August survey, a smaller percentage, 63 percent, backed the man who bested Clinton in the Democratic primaries. Both Obama and McCain have talked about bringing change to Washington, but Obama's message appears to be resonating more strongly with voters. Sixty-five percent of Americans think Obama and Biden will bring about real change in Washington, while only 46 percent think the same is true of McCain and Palin. But McCain has gained ground in this area. In July, before he chose Palin as his running mate, only 28 percent of registered voters said McCain would bring about real change if he were elected President in November. Forty-two percent of all voters say McCain would continue the policies of the Bush administration if he is elected president - slightly fewer than the 48 percent who said so last week. Voters are now more likely to expect McCain to adopt more conservative positions than President Bush, with 30 percent expecting a McCain administration to adopt more conservative policies. That's up from 20 percent before McCain selected his running mate. Each candidate has the same strengths and weaknesses as in previous polls; Obama still leads in understanding people's problems and bringing change, while McCain's lead in experience has expanded. Fifty-seven percent of registered voters say they relate to Obama, while 45 percent say the same of McCain; 76 percent say McCain is prepared to be president, however, while just 42 percent say Obama is prepared for the job. Fifty-five percent say McCain is "very likely" to be an effective commander-in-chief, up from 46 percent last week. One in four registered voters says the same of Obama. Forty-one percent of Obama backers who have reservations about the candidate cite "inexperience" as their primary concern, while 13 percent of McCain backers with reservations cite the possibility that McCain will be too much like the current president as their primary concern. Republicans took numerous shots at the news media during their convention last week, and a majority of voters believe the media have been harder on Palin than the other candidates. Voters are more likely to say the media have been easier on both Democratic candidates, especially Obama, who is cited by 36 percent of respondents as the candidate upon whom the press has gone the easiest. This poll was conducted by telephone September 5-7, 2008 among 738 respondents first interviewed by CBS News and the New York Times August 15-19,2008. CBS News re-interviewed 655 registered voters for this poll. The error due to sampling for results based on the entire sample and registered voters could be plus or minus four percentage points. The error on measures of individual change is much smaller.